I’ve always loved experimenting with my hair looks and get a little creative although I have to admit that I am not the handiest person ever. There are a few things I can do pretty well when it comes to hair styles, like a nice sleek pony tail, but even when it comes to curls : I can somehow mess it up pretty dramatically! However, there’s always been one thing that I absolutely loved and it’s a good braid. Oh yes. Especially because I have such long hair and that it just keeps going in my face all the time. A braid is so elegant, fresh, effortless and above all so easy to do! Plus the options are limitless, there are literally hundreds of types of braids you could possibility do. And that’s just even more fun to play with. For a long time I thought that a braid was THE perfect look for a work-out because when you jump around, a chignon tends to get too loose and a pony tail is a bit too thick for when you lay on your back on a yoga mat. A braid is flat enough and holds everything in place for you to jump around like a monkey and sweat it out. On the other hand, I would always braid my hair while travelling. Just because it’s so nice to land somewhere, take off the braid and see little curls appear in your hair. Plus it makes you look super cute while on the go. I’ll also admit that I’ve developed a reflex of braiding my hair every time I get slightly bored or while waiting : I mean doing a little fishtail in your hair is probably the most entertaining thing you could do while in a waiting room. Except for checking Instagram of course. So today I wanted to share with you two of my favorite braid looks that I created together with the Kérastase team. They just released the most awesome book called the “Book Of Braids” with some beautiful illustrations for each hairstyle. There are tons of different styles to pick and choose from and many of them are inspired by popular street style looks which means : these are all achievable by yourself in the comfort of your own home. The first look I wanted to show you is the loose side braid which is kind of this super effortless style that you’d create in a few minutes while heading out to lunch with friends. I like wearing it when my outfit is very chic and sophisticated to contrast a bit. I love both the looks! I wear the side braid a lot but I'd love to rock the high pony braid I just wish my hair was a bit longer for it. I love love love these two looks! Especially the second one! It's so modern and edgy but still soft at the same time! I wish I had longer thicker hair so I could do these looks better! Hi Kristina! I love the braids, they look great and the second one it's just perfect for a work out. Love how you look with that hairstyle. Btw! I love your earring so much, where can I find it?? It's so cute! beautiful! as always stunning! what's the name of the lipstick in the last photo? kristina tu es adorable avec la tresse ! je préfère la tresse haute mais l'autre aussi ! les tresses me rendent fous !alors tu vois tu as trouvé ce qu'il fallait pour me séduire !!!! vraiment belle !!! avec les tresses ,pas de stress!!!!!! Love the braided look on you! You're totally right about how chic braids can be! love these braids! will definitely have to try them out soon! Love your braids, the tighter one is my fave! Cool braids! I love braids myself mostly because of the comfort! 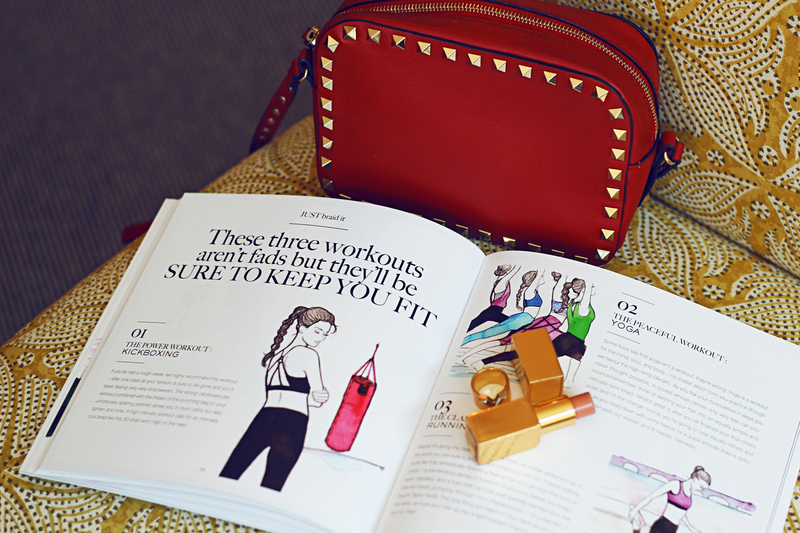 ;-) I like your looks here, first is perfect for a night-out and the second for a workout! Great! Both braids look amazing on you, Kristina! Braids are definitely one of my fave hair styles! I love the braids so feminine and so cute! Love your long hair! You look so beautiful! Have a good day! Lovely post as always! Thanks for the book! I am excited to experiment with braids as well! You look amazing on this pics here! I super loooove your hair!!! You're so beautiful Kristina, you're amazing and so funny. You're an inspiration for everyday ! You're so beautiful and amazing Kristina, You're such a big inspiration for a lot of girls. Totally love braids in summer and yours looks absolutely gorgeous! Quand j'étais petite, je rêvais d'être blonde avec de longs cheveux. Bon... Je suis afro et mes cheveux sont tout sauf longs et beaux ! Pas de milliers de choix de coiffure pour moi... damn !! These look fantastic! I will definitely be trying out some of them! Amazing Make up. The braid looks are lovely! J'adore ces deux looks. Je suis également dan de tresses, c'est pratique et joli comme tu le disais. Traumhaft schöne Fotos und die Frisur steht Dir wundervoll. Your hair looks amazing ! I absolutely love it when its braided in the ponytail! your makeup is always on fleek!! I agree with you on the hair situation, it is definitely not my strong point. I love a good braid, so this post was perfect! Your braids hairstyles are really awesome, I love it ! I am so glad that you posted this Kristina because I have been trying to get back into braids. They are beyond perfect for the summer. Thanks for the great hair inspiration! Both looks are great and sophisticated! Love the hair and the accessories! Do you even have one bad photo?! hahaha, love you! Such a fierce look! That braid is amazing! Hi Kristina! I just love your style so much! Not only are you elegant and beautiful but you're so down to earth. I love reading your articles because your writing style is as if you're having an actual conversation with your readers. Amazing photos ... and braids ! I love braids! The problem is that I don't knoow how to do it myself... also, I have quite thin hair, so even though I wear it long, the braid doesn't come too thick. Check out my new post "Dear old fashioned e-commerce" and the new social media apps that allow the user to shop Luxury Goods! I also invite you to join me on my new Facebook page! Kristina you are perfect as always! I really wanna know the label of your earrings / earcuff ... I love them !! A simple braid is a nice alternative to a ponytail! I love this blog post!! Love your photos more and more, such a great job! Love your hair! Beautiful ideas for summer and amazing pictures! I can see significant increase in volume in your hair. Love that stylish braid on you. That is such a useful post for everyone with long hair and with hot season coming! Love your posts :D :D !! Absolutely love braids. HIFI girl :) ! Love the look! The braid is perfect for so many occasions. Cute and casual, or sleek and elegant. I'm a fashion blogger in NYC. Check out my look at sustenanceandstyle.com. Follow my adventures as I explore the best of New York's fashion and food. Contact to collaborate! Fantastic braid and post! Have a nice day! Lovely pictures!! I love the braids. You're so right! A braid is the PERFECT hairstyle, and it looks truely amazing on you! I've never seen anyone rock the slick back look like you did. So beautiful. Your hair is amazing. Love this firm as well. I've always thought you looked amazing wearin a braid. The first look is my favourite! Braids are my favourite hair style, they look so elegant however you do them. Does anyone know what is the earring that Kristina is wearing? Earcuff brand? I've been trying to figure it out for a while ... No hopes that I can find this info. I just lie it a lot! And it looks great on Kristina! Au fait, d'où vient ton collier avec la petite étoile que tu portes? Il est juste parfait. Do you remember what lipstick and eyeshadows you used here? Love these hair looks! Soo Chic! Love this simple look! Way to make a braid look stunning. Love your hair and the jewellery! Where is the jewellery from? Especially the inner corch piercing? Or is it not a real one? wow different look!!! braid really looking great on you. You look outstanding!! Such a beautiful, sensual and feminine photos!! Always love your hair styles girly! So sleek and sophisticated! you still look gorgeous, keep going as you do with true people and loving life! Flawless skin. You look amazing! !